It’s all about perspective. I love this post, because it gets to the heart of why we need to understand our kids, our special kids, and not push them into a mold because we think it’s “easier”. I can’t say it any better than this post does. My son doesn’t script. He has favorite songs, etc., but he has “typical” verbal communication abilities. If your child DOES script, please read Diary’s posts related to this. Scripting is often communication (from everything I’ve read by parents and autistic adults). Stopping scripting stops a potential avenue for communication – our most desired and NEEDED thing in our relationships. Last night, we took Luau out for his birthday. Since I’d been chronicling the day in pictures from the start, I had my phone close at hand. I figured I’d get a snap of the ludicrous 22-ounce steak he’d ordered or something else equally banal. Instead, what I caught was magic. Back in September, I wrote the following on Diary’s Facebook page. 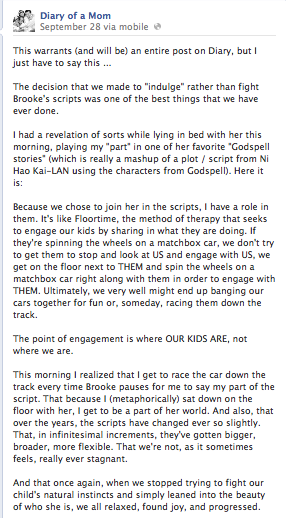 In the pictures that follow, Luau is scripting with Brooke. This blog post is important for everyone, especially for neurotypicals and neurotypical parents of autistic children (heck, and non-autistic children as well). Autistic people already know how important it is to NOT make compliance the most important piece of education for autistic children. “Why?” some of you may ask? The most benign reason is that when compliance is the focus, the individual is at risk of sacrificing who they are for who they think people want them to be. The most dangerous reason is abuse – emotional, physical, sexual. When compliance comes before all else, how can you say “NO!”? Somehow, we parents of autistic AND neurotypical children need to, through building MUTUAL respect, help our kids discover and become the best possible people they are. Raising compliant children is easy – it’s based on fear, intimidation and superficial thinking. Thoughtful, responsive, investigative, respectful parenting – basically modeling the behaviors we want our children to have – takes a LOT of work, but it’s worth the effort when the result is a strong, healthy, safe, confident child. As the mother of a child a few years away from puberty (but not that far), I worry that I will give not enough or too much information. My son is very literal, very factual, very science oriented. He drew RIBS and NERVES on a stick figure in kindergarten when he learned about them from a medical picture book we had at home. Puberty is confusing enough when your neurotypical – add in social confusion and literal thinking on top of that and the prospect is even more daunting. 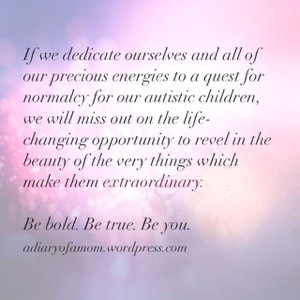 This blog post is from the autistic female perspective, but it speaks to the need for knowledge/information that all our kids should have, beyond “don’t do it till you’re married”. I fully intend for my child to know, understand and respect his body and the bodies of others. I want him to be safe and I want to spare him as much confusion as possible.